We think this watch has attitude. 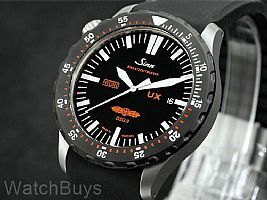 Sinn took all that's great about the Sinn UX GSG9 and added an all new black bezel. This bezel has been fully Tegimented to 1,500 Vickers, or more than 7 times the hardness of standard stainless steel. The new black bezel creates a perfect contrast with the submarine steel case, and with the white and red markings is highly legible. 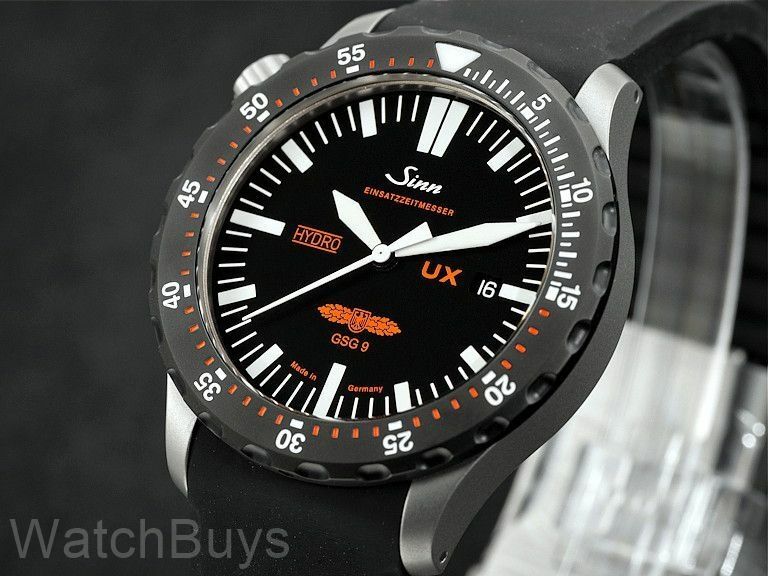 The Sinn UX GSG9 SDR pushes watch technology to the limits. Like the Sinn U1 and U2 watches, the Sinn UX GSG9 SDR features a case made from the same submarine steel that is being used to build the latest generation of German military submarines. The steel was procured by Sinn from a steel supplier to Emden GmbH, one of Germany’s North Sea shipbuilding yards who construct submarines from the very same steel. This special steel is also amagnetic which means that is does not have magnetic properties and cannot itself become magnetized. The watch movement itself is protected from magnetic fields up to 4,800 A/m. Unlike the Sinn U1 and Sinn U2, the Sinn UX GSG9 SDR features a quartz movement rather than a mechanical movement. The Sinn UX GSG9 SDR is covered with a thick sapphire crystal for extreme protection. This sapphire crystal features a special anti-reflective coating that is scratch resistant - the coating itself has been hardened to 1,800 HV. Matte black dial with date at 3, Super Luminova on hands and markers, and striking red seconds hand complete the design. Other features include sapphire crystal with anti-reflective coating. Strap is silicone rubber with double push deployant buckle and fliplock safety clasp. Very legible and comfortable. The oil filled method is very useful and really works well. Excellent communication and fast delivery by the Watchbuys staff. I wouldn't hesitate to order this watch if you're on the fence. Verified Owner Comments: I wanted something a little different from my Sinn U1 but still maintain the rugged no nonsense appeal. This UX GSG-9 is perfect. It relegated most of my watches to standby duties. The legibility is awesome and illusion of the hands looking like they're stuck on the crystal is trick.